Recently I had to upgrade an Exchange 2013 platform from CU2 to CU5, there were four Exchange 2013 Client Access servers and eight Exchange 2013 Mailbox servers (in a DAG). During the upgrade of the Mailbox servers users were presented with the dreaded “The Microsoft Exchange administrator has made a change that requires you quit and restart Outlook.” dialog box. This is expected behavior when moving from Outlook Anywhere to MapiHttp (since the Outlook profile needs to be updated for this change to take effect) but in this scenario MapiHttp was disabled. The message popped up totally unexpected. The bad thing is, it popped up every 10 minutes or so. Microsoft has experienced similar issues when Mailboxes are moved from Exchange 2010 to Exchange 2013 as described in this knowledgebase article. 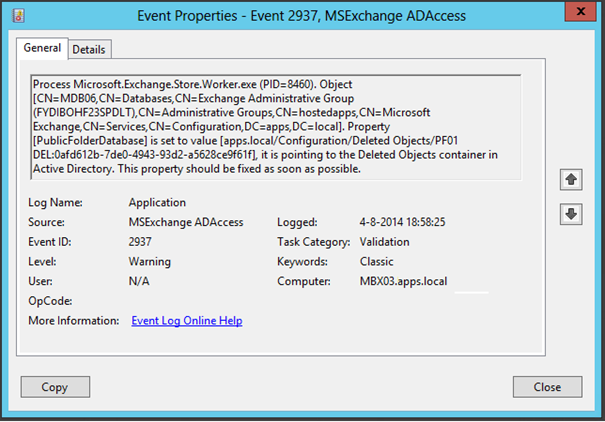 In my scenario Mailboxes were moved from Exchange 2010 to Exchange 2013, but this was somewhere between 9 and 12 months ago. And the platform has been pretty stable so far. In this knowledge Microsoft recommends repairing the Outlook profile or recreate the Outlook profile. Not a big deal for a few users, but when running a platform with multiple thousands Mailboxes this is not an option. In this article Public Folders are mentioned as well, but Public Folders were decommissioned between 9 and 12 months ago, in the same timeframe as Mailboxes being moved from Exchange 2010 to Exchange 2013. DEL:0afd612b-7de0-4943-93d2-a5628ce9f61f], it is pointing to the Deleted Objects container in Active Directory. This property should be fixed as soon as possible. Use the Edit button to clear the reference from this property, restart the Information Store (or do a Database failover in the DAG) and the the popup never shows up again. Why is this property populated with a reference to the Deleted Objects container? 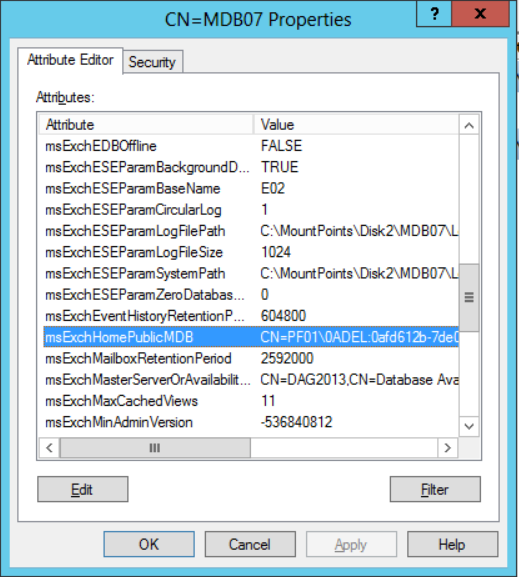 Most likely the Public Folder database wasn’t decommissioned properly, with ADSI Edit for example and not with the Exchange Management Console or Exchange Management Shell since these last two will also remove references from other objects. Why has this issue been living here for about a year and does it only show up after an upgrade from Exchange 2013 CU2 to Exchange 2013 CU5? Unfortunately I cannot answer this question at this moment and I haven’t got a decent answer from Microsoft yet. The only thing I know at this point is that Microsoft supports only 2 versions of Exchange 2013 (CU5 and CU4=SP1) and that CU2 is not supported. Therefore, an upgrade from CU2 to CU5 is not supported either. This should have no effect on issues like described above, but I’m afraid this might indicate I will never get a decent answer on what’s going on here. Still have this issue even after applying your solution…..
Do you already have another solution for this issue perhaps? Unfortunately there are a dozen causes for this issue so I’m afraid I don’t have an out-of-the-box solution for this. I removed the line on the wrong database before, now I removed it at the mailbox of the exchange 2013 server and now it looks that your solution did solve my issue.